MANCHESTER – 27th March 2019: This month’s Innovation Insight delves into the world of low-sugar, low-alcohol drinks, shining a spotlight on a new launch that creatively fuses together flavoured alcoholic beverages and bottled water: Balans Aqua Spritz. Promoted as “a brand new Swedish brand and drinks concept”, Balans Aqua Spritz is described as a 4% abv alcohol-infused sparkling water with a hint of natural fruit flavour. New in the UK from cidermaker Kopparberg, the product contains carbonated water as its primary ingredient alongside an apple juice base and natural fruit flavouring. According to Kopparberg, a unique fermentation process, in which the sugar in the apple juice is broken down into alcohol, creates a low-calorie alcohol base for the product. 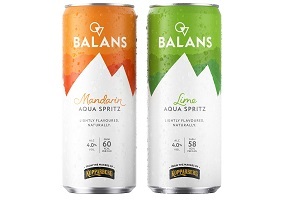 Balans Aqua Spritz comes in Lime and Mandarin flavours, the latter described as containing just 60kcal and 0.6g of sugar per can. While there may appear to be an inherent contradiction between an alcoholic drink – especially an FAB – and perceptions of health and fitness, launches such as Balans Aqua Spritz are clear indicators of how consumers increasingly associate water in whatever guise as a “clean” and “healthy” choice. Just as in the soft drinks space, the importance of “pure”, “natural” and even “healthy” may become ever more relevant in alcoholic drinks, especially when targeting younger generations of health-conscious consumers.